The new formulations launched are just another example of our constant effort to improve our catalogue and maximise the efficiency of our solutions. The R&D, Chemical and Industrial teams carry out periodic reviews of our catalogue with the purpose of assuring that both the quality and efficiency of our products comply with Tradecorp’s standards. The Tradecorp’s effort to seek maximum quality has allowed to obtain new formulations, such as Humifirst Opti and a new version of the Saltrad product. Both have kept its efficiency and advantages. Moreover, they bring a series of improvements easing application and preserving product quality. 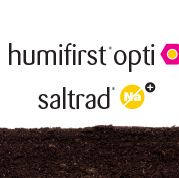 Tradecorp extended its humic range with Humifirst Opti, a liquid solution characterised by its quick action in improving soil quality from a physical, chemical and biological point of view. It is completely water soluble with no risk of forming any type of clump or insoluble sediment. New Saltrad’s action has not changed, as it is still the ideal solution to correct problems associated to saline and saline-sodic soils, with the advantage that it now has a new consistency improving the product preservation inside its packing and easing its application. Tradecorp keeps striving to achieve quality and efficiency to ease the farmers’ work.